will follow the event each night. Themed "The Bell Witch and Other Southern Ghosts," this event will feature the books, "The Bell Witch - The Full Account" and "Ghostly Cries From Dixie." Come out and spend the evening with Pat Fitzhugh, discussing the Bell Witch and all things paranormal! Join Southern authors Sue Clifton and Pat Fitzhugh for a weekend of food, fun, storytelling, and ghost hunting, at CNN's #3-ranked most haunted place in America, The Thomas House! There will be a country dinner buffet, a play ("Ghosts of the Inn"), a candlelight tour of the building, overnight ghost hunting, and a breakfast buffet. Join "Into The Afterlife Paranormal - Tennessee Chapter," and author Pat Fitzhugh, for an informative, fun-filled weekend of paranormal fellowship, learning, and investigation. This event is for paranormal groups AND the general public. Paranormal teams from around Tennessee will have an opportunity to network with each other and showcase their equipment and techniques, as well as answer questions from the general public. There will be a country dinner buffet, an overnight paranormal investigation for registered overnight guests, and a breakfast buffet the next morning. Themed "The Bell Witch and Other Southern Ghosts," this event will feature the books, "The Bell Witch - The Full Account" and "Ghostly Cries From Dixie." Tickets (free) are available at all library branches and through e-mail. Click the link to your right for more information. Lecture part is from 6 to 6:40PM. Q&A and signing will follow. Tennessee author Pat Fitzhugh discusses the infamous "Bell Witch" legend in a one-hour interview on The Twilight Hour. Author Pat Fitzhugh joins Canada's Nocturnal Frequency Radio for a roundtable discussion about the future of the paranormal. Where is it heading? What could happen? Can it be reshaped into a constructive field? Listen to 2013-The New Paranormal Realm on Sunday's "Dark Discussions Roundtable" to find out. Tennessee author Pat Fitzhugh joins Crossing the Void Paranormal Radio for a two-hour discussion about his writing, the Bell Witch, and other weird and ghostly tales. Tennessee author Pat Fitzhugh joins Paranormal Insider Radio for a two-hour discussion about the Bell Witch legend of Tennessee. 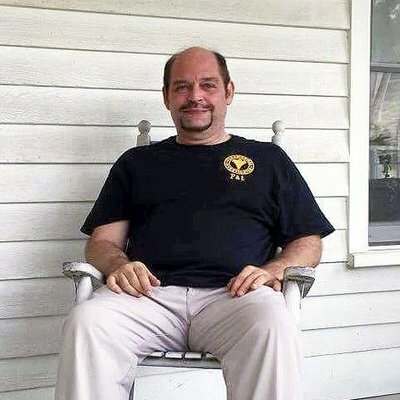 Tennessee author Pat Fitzhugh joins The Fringe radio show for a one-hour discussion about the Bell Witch legend of Tennessee, ghosts and the paranormal, and his writing. The Thomas House Hotel, Red Boiling Springs, TN. 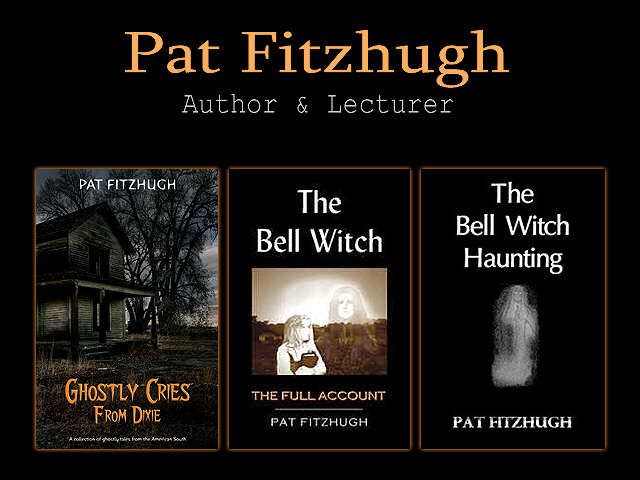 - Lecture: Pat Fitzhugh presents, "The Bell Witch of Tennessee and Mississippi." 5:30 P.M. to 6:30 P.M. (free to attend). - Book Signing: 6:30 P.M. to 7:00 P.M. (free to attend, except price of books) Pat Fitzhugh will sign "The Bell Witch: The Full Account," "Ghostly Cries From Dixie," and "The Legend of Stuckey's Bridge." - Dinner: 7:00 P.M. to 8:00 P.M. ($13.50 + tax, per person; fried chicken, biscuits, and other country delights, served family-style. RESERVATIONS REQUIRED two days in advance, call 615-699-3006). - Play: 8:00 P.M. to 8:45 P.M. "The Ghosts of the Inn." (Package deal: dinner + play + tour: $25 + tax, per person. RESERVATIONS REQUIRED two days in advance, call 615-699-3006). - Tour: 9:00 P.M. to ?? Candlelight history and hauntings tour of all rooms and common areas of The Thomas House Hotel. (Package deal: dinner + play + tour: $25 + tax, per person. RESERVATIONS REQUIRED two days in advance, call 615-699-3006). See you there. Pleasant dreams. Author Pat Fitzhugh will be on hand for Bell Witch storytelling and signing the books, "The Bell Witch: The Full Account," "Ghostly Cries From Dixie," and "The Legend of Stuckey's Bridge." Also: DJ and costume contest. Pat Fitzhugh will be a special guest co-host on Canada�s Nocturnal Frequency Radio, Sunday October 27th. This is the show�s annual HALLOWEEN episode, with call-in lines for listeners to tell about their favorite ghost stories or paranormal encounters. Have a story or experience to share? Want to hear some scary stories? Join Steve, Alex, and Pat on Oct. 27th for two hours of fun and fright! Author Pat Fitzhugh visits Walker's Bookstore in Fairview, TN, to retell and discuss the "Bell Witch" legend. Immediately following the lecture and Q&A, he will sign copies of "The Bell Witch: The Full Account," "Ghostly Cries From Dixie," and "The Legend of Stuckey's Bridge." Whether you're an author or an author wannabee, come join authors Lori Crane, Pat Fitzhugh, and four others as they discuss their careers, thoughts, .processes, books, and the secrets (and pitfalls) that all aspiring authors need to know about! Author Pat Fitzhugh will discuss Memphis hauntings such as the Orpheum Theater and the Sultana Disaster, along with the Mississippi version of the "Bell Witch" legend, with hosts Stephen Guenther and Tanya Vandesteeg on the "Expedition Unknown" show at TMV Cafe Radio. Pat Fitzhugh will be a guest on "Crossing the Void" to discuss ghosts, his writing, southern hauntings, and all things paranormal, at Hey-Z Radio (The Energy Drink for Your Soul). Archives of some past radio interviews may be found here. For more information about Pat Fitzhugh's latest book, Ghostly Cries From Dixie, click here. To be automatically notified about new events, please visit Pat Fitzhugh's pages on Facebook and Twitter. Pat Fitzhugh is available for speaking engagements, book signings, and radio/TV interviews. Please click here for details. Duplication of the Bell Witch Web Site in whole or in part, in any manner, including but not limited to electronic storage and retrieval systems, is a violation of United States and international copyright law. The owner of this site reserves the right to investigate and prosecute any individual or business suspected of being in violation, at any time, without further notice being given. Click here for usage information. The Bell Witch web site takes very seriously its responsibility to report the legend of the Bell Witch of Tennessee in an ethical, legal and unbiased manner, and we encourage you to do the same.